58% of all Miami-Dade households are one emergency from falling into poverty. For these ALICE (Asset Limited, Income Constrained, Employed) families, receiving free tax return assistance from IRS-certified volunteers can help set them on the road to financial stability and prosperity. United Way of Miami-Dade advocates to expand these programs to help more families. 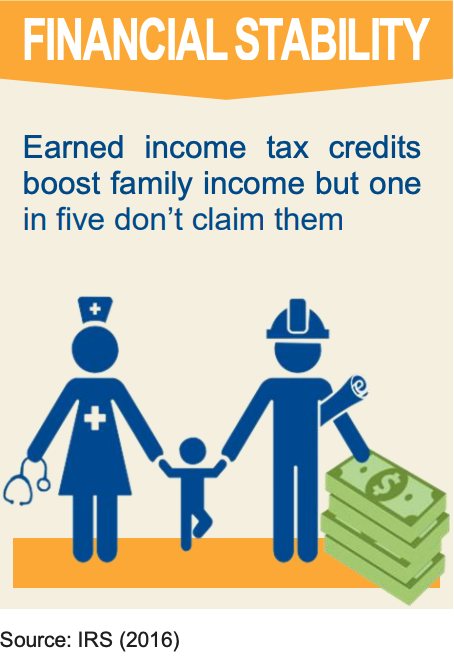 In 2019, United Way is advocating for $1.2 million in state funding to expand the capacity of tax preparation assistance programs statewide to help ALICE families claim their EITC refunds. Read more about our financial stability plan to support working families so together we can create a thriving community. Florida is in the midst of an affordable housing crisis. There are 912,967 very low-income Florida households—which include hardworking families, seniors, and people with disabilities—pay more than 50 percent of their incomes for housing. Florida has the third highest homeless population of any state in the nation, with 32,190 people living in homeless shelters and on the streets. This includes 2,817 veterans and 9,422 people in families with at least one child. Furthermore, low-wage jobs are prevalent in Florida’s economy. Many occupations do not pay workers enough to rent a modest apartment or buy their first home. Florida’s affordable housing programs create thousands of jobs and billions of dollars in positive economic impact. Many consider them to be the single most powerful economic driver in the state. In 1992, the Florida Legislature adopted the William E. Sadowski Affordable Housing Act, establishing a dedicated revenue source for affordable housing. Sadowski Act monies are intended to be used to fund affordable housing programs including purchase assistance, home repair, multi-family gap financing, barrier free home improvements and foreclosure counseling. To learn more about our affordable housing plan, click here. Many veterans face major challenges transitioning back into civilian society and may have service-related health issues that can severely impact their family and work lives. Transition challenges include reconnecting with family and re-establishing family roles, becoming part of the community, entering the civilian workforce (perhaps for the first time) or returning to a job and trying to catch up, adjusting to a different pace of life and work, and creating structure and adjusting to providing basic necessities (e.g., food, clothing, housing) previously provided by the military. To learn more about how we are going to support our Florida veterans, click here.